The IGT-CRYPTO Team provided updated information on project development and future plans. 1) Bank transfers have become more accessible. Each user gets a personal IBAN. It has become easier to transfer funds to and from the account, transfers are specified as transfers of personal funds between user accounts. 2) The average daily turnover on the exchange has increased up to 250.000 $ for the last 2 months. 3) Expansion of payment methods on the platform (for more details go to igt-crypto.net). 4) Expansion of the server infrastructure of the exchange; security systems have been updated. 5) Participation in the IBM program of development and support of cryptocurrency projects. 6) Introduction of Chainalysis cryptocurrency monitoring and analysis services. 7) The introduction of modern rules of KYC and AML for the operation of cryptocurrency exchanges according to the recommendations of FATF. 8) Positive influence on the formation of public opinion in relation to world regulation and circulation of cryptocurrencies. Participation in legislative activities. 9) Functionality of the platform has been updated and expanded. 10) IGT-Token distribution to bounty program participants and other users for contributing to the development and support of the IGT-CRYPTO platform has been completed. 11) Rules for conducting tokensails (IEO), as well as criteria for selecting projects, methods of analysis and evaluation have been developed. Criteria and rules for selecting projects for listings have been compiled. 1) Listing of new projects and token sales (IEO) on the IGT-CRYPTO platform. Details and application form will be published on the IGT-CRYPTO.net website. The listing plan and projects that will be listed will be presented in official sources of information. 2) Taking into account the interest from the part of IGT-CRYPTO users in conducting IEO for IGT Token, a vote will be taken among the investors of the project, the final decision will be based on it’s result. 3) Withdrawals of IGT-Token to external wallets, listing of IGT-Token to IGT-CRYPTO and leading trading platforms. 4) The dividend payouts to token-holders for the first quarter of 2019. 6) The IGT-CRYPTO team is working on the received listing offers. Information about listing and the schedule will be published in a separate article in the near future. Stay tuned for information on the official sources of the company: links. UX \ UI, Functional expansion of trading options, adding new types of orders. Extended API for account management. Active work on the development of the proprietary IGT ecosystem coin. 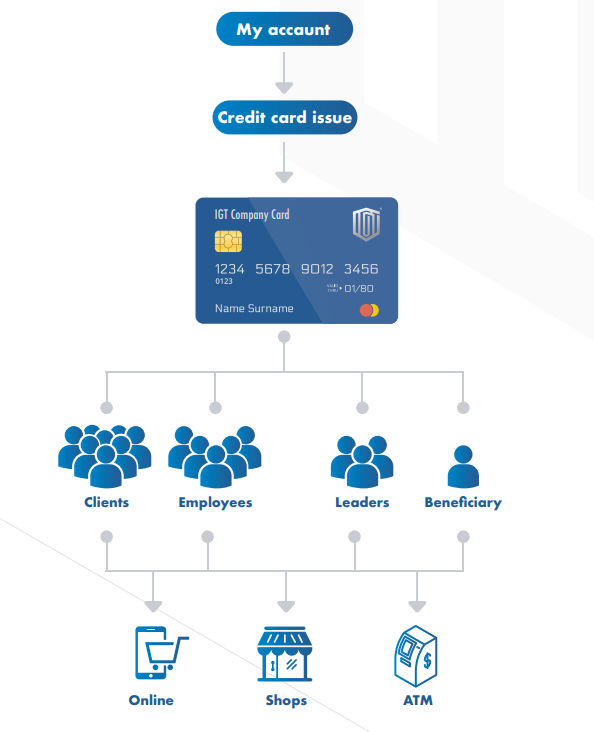 IGT Company debit cards give users access to their IGT-CRYPTO funds. Using our platform gives our customers not only the opportunity to be holders of digital assets, but also use them to purchase real physical goods. We have developed a model that allows our users to order a plastic card linked to the balance of their accounts on the IGT-CRYPTO exchange to make online-shopping or to use payment terminals. Funds from the user’s balance are converted into the currency in which it is necessary to make a payment (EUR, USD, RUB). This is a revolutionary solution that allows cryptocurrency to become not only a means of storage, but also a real means of payment. Join our community and keep up with the latest news!